A classic of the style, with quince and yellow fruits, plenty firm mineral acidity, and a dry finish. Drink with charcuterie or rich seafood dishes. 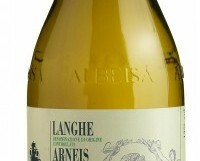 Arneis is a local Piemontese grape variety, and the name of the wine. The sandy soils of Roero are said to produce the best wines. This wine is from the wider Langhe area. I am very fond of Arneis; it has a cool, mineral quality and makes a pleasant change from many of the better-known grape varieties.